This projects aims at the first experimental realization of heteronuclear Rydberg molecules and their use as a microscopic correlation probe for degenerate quantum gases as well as an integral part in the study of ultracold atom-ion collisions in the quantum regime. First, we aim for probing spatial correlations of fermionic and bosonic quantum gases with the help of heteronuclear Rydberg molecules. Since the Fermi length is similar to the size of the Rydberg molecule for typical parameters, we expect that the quantum statistical correlations of the 6Li Fermi gas manifest themselves in the Rb*-6Li Rydberg molecule spectrum in comparison with the Rb*-7Li spectrum for the bosonic 7Li. Furthermore, we plan to monitor the changing correlations in the 6Li quantum gas when going from the weakly-interacting regime to the strongly-interacting Fermi gas close to a Feshbach resonance. In the latter regime the scattering length between 6Li atoms is very similar to the size of the Rydberg molecule. Summarizing, Rydberg molecules are an ideal microscopic probe for spatial quantum correlations. Second, we want to extend the investigation of atom-ion collisions from the so far studied cold, essentially classical regime to the ultracold, quantum regime. We want to observe and characterize quantum features of the elastic scattering process between Rb+ and Li both in the total and in the differential scattering cross section. The Rb+/Li ion-atom combination is well-suited for reaching the ultracold scattering regime due to its small reduced mass. 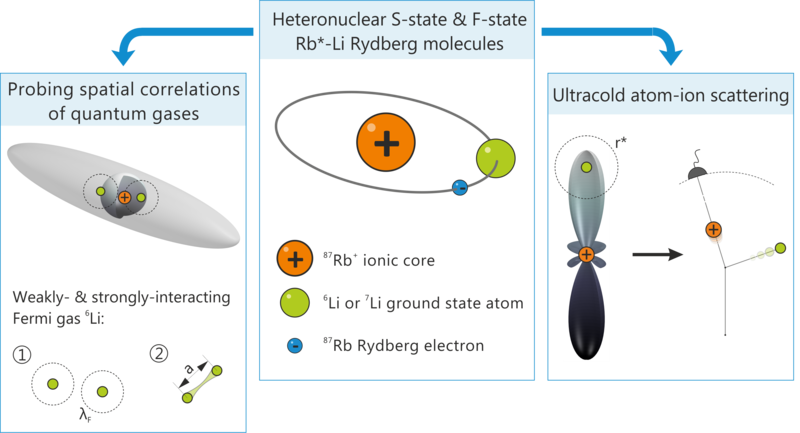 F-state Rb*-Li Rydberg molecules provide excellent starting conditions for the scattering process since the molecule is aligned to the laboratory frame and, additionally, the initial distance of the scattering partners is small enough to prohibit leaving the s-wave scattering regime due to the unwanted acceleration of the ion caused by stray electric fields. For recording the differential scattering cross section at various collision energies we will use an ion detector with a high temporal and spatial resolution. Therefore, Rydberg molecules provide a pathway to the so far unexplored territory in ultracold collisional physics between atoms and ions.